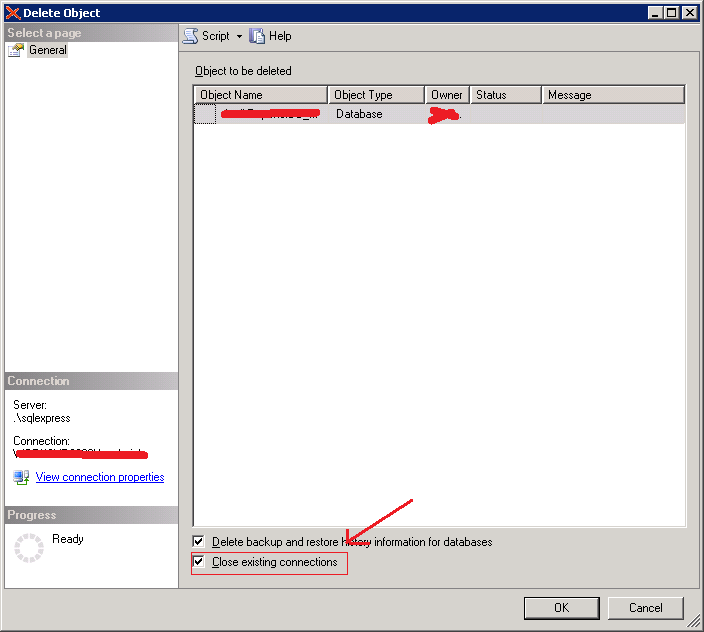 In this article, I am going to give Fix/Solution for the error 'Cannot drop database because it is currently in use' in MS SQL Server.. This error occurs when we try Delete or Drop database while the database connection is used by other users or other resources. So we need to close existing connections first then we need to Drop or Delete the database. 'Msg 3702, Level 16, State 4, Line 2 Cannot drop database "MorganDB" because it is currently in use. ' because here we are using USE [MorganDB] as source DB to delete itself, so we need to change it to USE [master]. After changing source database as master, the script should works successfully. But sometimes connection may be opened by any other user. So, in that case, we also need to close existing open connections. You can use the following C# code to close existing database connections and Drop or Delete Database in MS Sql Server. If you try to dropping a database in Sql Server Management Studio UI when an user connected to the SQL Server Database you will receive the below mentioned error message. You can avoid this error by checking the option Close existing connections.